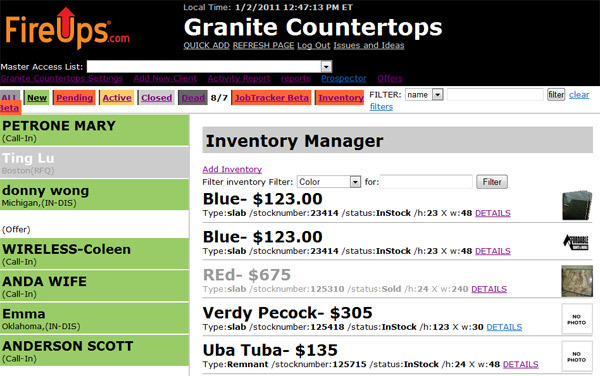 New Feature Announcement: You now can manage your inventory within our lead tracking solution. If your sales person is able to access current inventory as well as remnant they will have more information available to bring someone through the door. slab inventory can be added to our inventory system as well as remnant product. The details of the remnant piece should be collected at time of the remnant being created. this piece can be photographed, measured and given a unique number. This information is then passed to the administrative staff who then adds the details and the price to the inventory manager. Now this remnant piece is available for sales people to easily speak to the remnants that are currently available and move this person into the showroom. The effort on the front end truly makes the sales process faster. FireUps.com Lead manager handles all of your lead sources in one place. All your phone calls and webform leads are collected in one place. even walk ins are managed in one place. Contact FireUps for your Local Granite Online Marketing Needs. Once we have established a based we can then start to monitor all of your advertising channels for Return on investment.